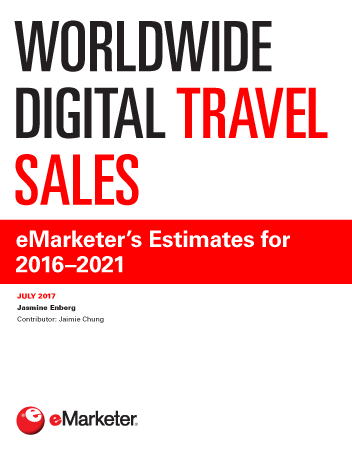 eMarketer estimates worldwide digital travel sales—which include leisure and unmanaged business travel sales booked via any device—will rise by 11.7% in 2017 to nearly $613 billion. Gains will continue throughout the forecast period, driven primarily by strong growth in Asia-Pacific. Asia-Pacific will surpass North America to become the No. 1 digital travel market in the world this year. This is due mainly to strong sales gains in China and India. On a country-by-country level, the US will still account for the largest share (30.9%) of worldwide digital travel sales in 2017. China is closing in, however, and each country will make up roughly a quarter of sales by the end of 2021. Despite safety concerns due to recent terrorist attacks, Western Europe remains a popular travel destination. Digital already represents a sizable share of the region’s travel market, and sales will continue to grow through the end of the forecast period. Argentina is Latin America’s fastest-growing digital travel market, and sales will keep rising as currency controls and import barriers continue to be lifted. Brazil will remain the regional leader in terms of total sales, however. Two major sporting events in Russia are expected to draw both foreign and domestic travelers to the country, boosting digital travel sales growth in Central and Eastern Europe in 2017 and 2018. "Worldwide digital travel sales will total $612.91 billion in 2017, up 11.7% from last year. Steady growth will continue through 2021, when sales will reach $855.07 billion."